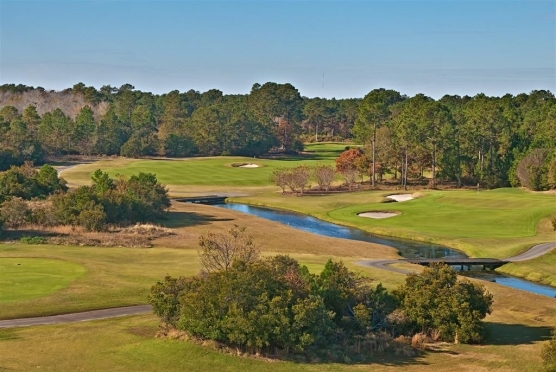 SUNSET BEACH, NC – Opened in the spring of 1990 this course is befitting of its namesake and architect, Rees Jones. A great test of golf for any skill level, the Rees Jones course is a must play on your next golf vacation. At 6761 yards from the Blue Tees, 6334 yards from the White Tees, 5716 yards from the Gold Tees and 4912 yards from the Red Tees there is plenty of length for every player on this Par 72 layout. The course/slope ratings of 73.1/135 (Blue), 71.4/128 (White), 68.0/119 (Gold) and 69.3/122 (Red) pretty much guarantee you’ll need every club in your bag. The architect provides accommodating, wide fairways and a look that’s pleasing to the eye and shows exactly what the hole offers. With seven Par 4s measuring 395+ yards from the back, a natural tendency is to simply “grip and rip.” One piece of advice is in order for the long hitters. Keep the ball in the fairway. Struggling with accuracy off the tees and finding yourself in the rough will add strokes to your round. The entire course is very well maintained, but the rough is a handful to manipulate. Opening the clubface ever so slightly may not be enough and you’ll watch your ball pull to the left. An identical swing later in the round with a more open clubface may find you further right than anticipated. The rough on the Jones course is a factor. We really appreciated the bentgrass greens on the Jones course. Although plugged a few weeks before we played, we found them very receptive holding nicely and putting quite true. Virtually every green is tiered; so do pay close attention to your yardage. The middle of these large greens is always a good place to land. The course does not get its length from the Par 3s. No. 5 is particularly attractive, but do make certain you have a club that gets to the middle. Although your ball flight looks to have considerable drop, it is all carry over water and plays longer than the yardage indicates. No. 13 is a very pretty hole, but well protected by a large waste bunker in the front. A slight elevation change makes proper club choice imperative. The Par 4s on the Rees Jones course are where the venue gets its length and certainly adds to the charm of the course. There are really no two holes alike. Picking a few favorites is difficult, but No. 6 is really a nice golf hole. Accuracy and length are necessary off the tee. Your drive needs to clear considerable water, while well-placed bunkers protect the left side of the fairway. Do not try to cut off too much of this dogleg left. An uphill second shot from a less than flat fairway challenges the best golfers. Par on this hole is outstanding. The boomers in your group will like No. 16. A big drive is necessary, if you plan to reach this 420-monster in regulation. It’s a 3-shot hole for the rest of us. Although the Par 5s are not particularly long, they do present a challenge and are 3-shots holes for most of us. Be alert to the water on the right that protects the green on No. 9. No. 18 is a good finishing hole. Play it down the middle from tee to green. Attempting to cut too much off the dogleg right brings plenty of trouble into play. Enjoy the Rees Jones course at Sea Trail. It’s well worth the short drive to Sunset Beach.